Have you heard about Día or El día de los niños/El día de los libros (Children’s Day/Book Day)? 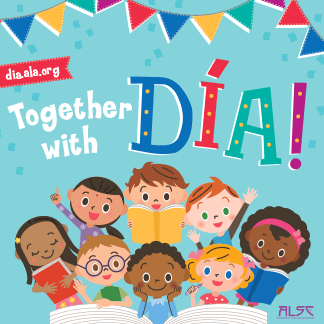 According to the Association for Library Service to Children (ALSC), “Día is a nationally recognized initiative that emphasizes the importance of literacy for all children from all backgrounds. It is a daily commitment to linking children and their families to diverse books, languages and cultures.” The celebration culminates yearly on April 30. Learn more about Día and find free resources! Start a book club, read about the Día program registry and explore the “Action” tab for more advocacy and professional development tools. Scroll down the “Free Program Downloads” page for booklists, resource guides, posters, coloring and activity sheets! Nothing says We’re Celebrating Día like a new poster! Customize this poster with your event information to promote your upcoming Día programs. Get this poster along with new web badges and Building STEAM with Día booklists. Use the web badges to proudly display your excitement and support for Día on your social media pages, websites and promotional materials. Let’s make 2017 the year people understand the importance of sharing excellent books filled with diverse characters and stories with our children. Celebrate children and connect them to the world of learning through books, stories, and libraries.